Best Laundromats in Bucks County & Mercer County | Laundry Depot Laundry Depot - Our laundromats in Morrisville PA, Newtown PA, Penndel PA, Ewing NJ and Burlington, NJ offer the ultimate laundry service experiences. Convenient locations in Bucks County and Mercer County. The largest laundromats in the Bucks/ Mercer area with high-efficiency washers and dryers - giving you the best results. Laundry Depot’s Wash, Dry and Fold service significantly frees up your time. Simply drop off your laundry in the morning on your way to work, and pick it up on your way home. We have the ability to handle commercial accounts for towel and linens for cleaning services and health clubs. 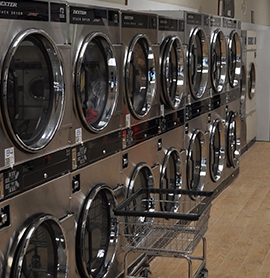 Our laundromats are attended and are kept to the highest standard of clean. That means you can trust that your clothes are safe with us. We feature a wash dry and fold service for those too busy to do their own wash. Relax, we’ve got it handled. We have the largest facilities in the Bucks/ Mercer area. They’re big, they’re beautiful and you’ll love them. My sister and I love coming here. No matter what kind of a day they are having, the workers always have a smile on their faces. The place is always bright and clean on the weekends. I use this laundromat on the occasion that I have too much laundry to do with a limited time span. The place is always spotless. ALWAYS! They are extremely polite and very professional.